"We have a big project coming up and need a unique way to inspire support from both active givers and those who have lapsed." For OneHope — a ministry dedicated to sharing God’s Word with children and youth around the world through proven Scripture-engagement programs — Christmas is a strategically important time for outreach and presents a great need for the generous partnership of donors. Invite their active ministry partners — those who had given in the last year — to take advantage of the unique opportunity to share Jesus with young people at Christmastime. Re-engage those who hadn’t given in as long as three years, encouraging them to partner with OneHope in ministry again. To accomplish both goals, we developed an “invitation” card package with a highly personal look and feel. The envelope was card-sized and faux hand-addressed using Autopen technology — a realistic way to give a handwritten effect without huge costs — to create curiosity and interest. 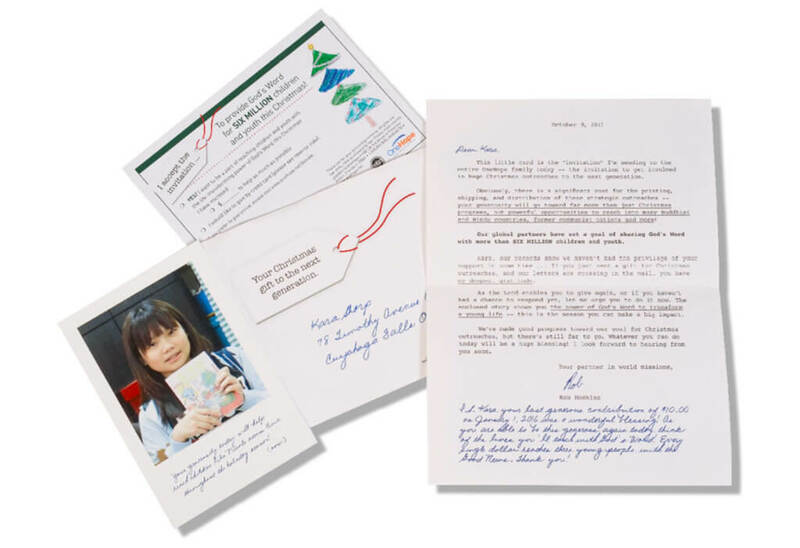 Inside, donors found a Christmas card featuring Nativity artwork by a child in Asia who had received God’s Word through OneHope. Not only was the child’s drawing reproduced with great quality (you can even see the eraser marks! ), but it also served as a powerful connection between the donor and one child who now understands the hope of the Gospel because of their support. The interior of the Christmas card featured a short note with a P.S. printed in Autopen to continue the personal feel. For lapsed donors, the P.S. served as a gentle reminder of the date of their last gift to OneHope — a way to help donors realize how long it had been since they last gave (as most donors think they gave much more recently than they actually have). We even enclosed a “polaroid picture” of the child who drew the nativity scene for the “invitation” card and shared her testimony on the back, also in the handwritten Autopen font. We obtained a strong ROI of 7.17 for this project. If you would like help coming up with creative and cost-efficient ways to engage both active and lapsed donors, we would love to talk with you.